Mega Fortune is an incredible five-reel and 25 pay line slot developed by Net Entertainment. The slot has a rich theme of premium budget living and flashy items. The game has every right to have a filthy-rich-looking theme since it holds the Guinness record of the best-paying online slot after it awarded a lucky player from Finland over €17.8 million in one spin! 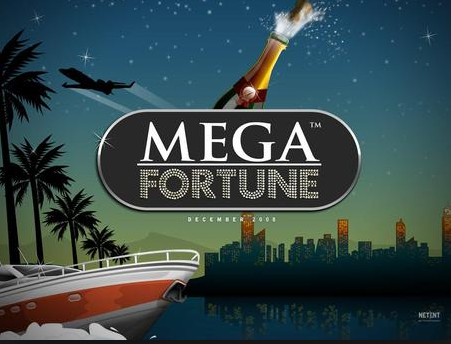 The symbols in use in Mega Fortune are; A Limousine, a bundle of Cash, a golden Watch and a bottle of premium priced Brandy. Mega Fortune also uses the traditional card faces which include Jack, King, Queen and Ace. The boat symbol plays wild. Like in many other slot games, the wild symbols substitutes for all other symbols expect the scatter symbol and the bonus symbols. The wild symbols come in handy when you want to complete a pay line and double your winnings. Landing five wild symbols rewards 10, 000 coins! Let’s cut the chase and jump straight to the slot. The bonus game has a spinning wheel that is divided into three tiers. The 1st tier is made up of small consolation prizes and forms the entrance to the second tier. The second tier offers instant cash prizes, but it also has two jackpot fields. If you manage to stop the wheel at this tier, you unlock the third and most lucrative tier of the bonus game. The third tier provides an average payout of more than a million dollars. The bonus game in Mega Fortune is activated when you land 3 or more bonus symbols on the 1st, 2nd, and 3rd reels. The free spins feature is triggered when you land three or more champagne bottles on any point of the reels. When you land the three bottles, you must choose one of the bottles. There are different numbers of free spins each with different multipliers. The multiplier can be as high as 5x. The icing on the cake is the fact that the free spins can be re-triggered. To re-trigger the free spins, you must land at least two scatters- the champagne bottles and you get a chance to choose between them. If you thought the 10,000 coins jackpot is huge, wait till you hear about the progressive jackpot. Mega Fortune is part of Net Entertainment networked progressive jackpot. The money in this jackpot is pooled from a certain percentage of all losing bets in all Net Entertainment powered casinos. The jackpot is always life changing with millions of dollars paid to date. There you have it. Mega Fortune is a simple game but with crazy payouts. I am a little disappointed that this game lacks the gamble feature, but who cares if its progressive jackpot offers such life changing payouts!